The Star cash drawer CB-92II was specially designed for demanding systems and checkouts, but also with an optical flair. This drawer is compatible with Star printers and with other manufacturers checkout printers. In only 460x460x113 mm, you will find eight coin cups and five horizontal bank note slots. This design ensures ergonomic handling, proper partitioning and a quick overview of cash stock, even during peak times. This model boasts high reliability and tested properties, meaning many years of smooth, uninterrupted operation. To give modern checkouts a more attractive feel, this drawer is available in either black or white, with a stylish chrome drawer front. 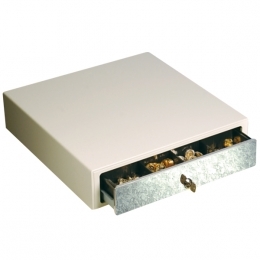 The steel-plate cash drawer comes equipped with a 3-position lock a switch ensures emergency access. Via the standard cash drawer connection, you can connect this drawer with all current Star POS printers, as well as all Epson printers.